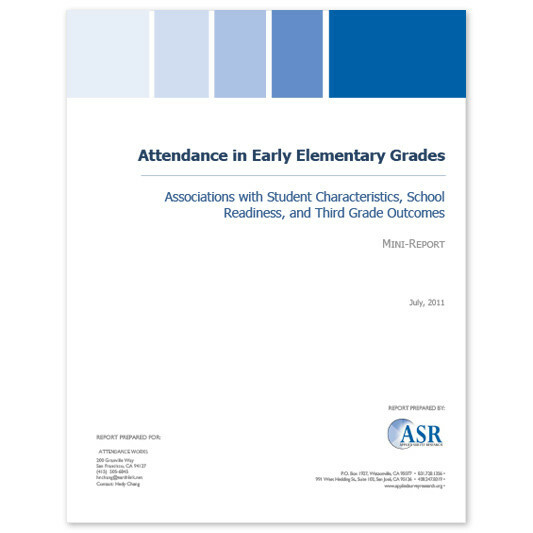 Attendance in Early Elementary Grades: Association with Student Characteristics, School Readiness and Third Grade Outcomes, Applied Survey Research, July 2011. This study suggests that attendance in the early grades is critical to sustaining the school readiness skills that preschool or Head Start programs can help children to develop. The report found that students who arrived at school academically ready to learn— but then missed 10 percent of their kindergarten and first grade years—scored an average of 60 points below similar students with good attendance on third-grade reading tests.